Posters and billboards are two of the most popular ways people use signs in their marketing. These two methods are popular because you can view them from a distance, and they can be displayed in public places where traffic is high. However, large posters on billboards, bus kiosks, and other such public spaces offer a difficult design challenge because they need to be readable from far away. Innovative new LED billboards are spreading gradually through major urban markets. CBS Outdoor has them in more than 30 U.S. cities; see its website for great examples (check out the options in digital media). The digital versions of billboards, urban panels (large screens positioned on subway station entrances in New York City), and other digital options can be programmed to change frequently, so you can chose time slots instead of having to commit to a static billboard or poster that’s there all the time. The next sections give you some important pointers to ensure that if you decide to include posters and billboards in your marketing, you do so successfully. 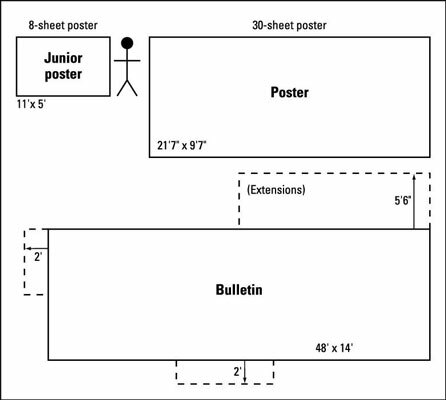 Bulletin: A bulletin is a huge version of the poster that usually measures 48 feet wide by 14 feet high (these ads may be 10 x 30 feet or 10.6 x 30 feet in places). You can extend bulletins with extra panels on the bottom, sides, or top (see this figure for details). A bulletin is four times as big as a 30-sheet poster, giving it incredible impact close up. Bulletins also make the text readable from a greater distance, so they work well along high-speed roads where the viewer isn’t near your ad for long enough to read anything requiring close attention. 8-sheet poster: Also referred to as a junior poster, a standard 11-x-5-foot 8-sheet poster is perfect for sidewalk-level viewing. This poster is about one-sixth the size of the standard 30-sheet poster. But when you place an 8-sheet poster closer to viewers than a standard-sized poster can be, it’s sometimes even more effective than the bigger formats. Advertisers seem to think so anyway; the format is very popular with them. Spectacular: If you really want to make an impression, you can choose something oversized (and not standard). In other words, you can use a huge spectacular, a custom-made, often building-sized display such as the ads that grace Times Square in New York City. These massive ads cost a bundle, and you should generally treat them as long-term, image-building investments. Few rules apply to spectaculars — aside from the rules of gravity and engineering — so you can have some fun with this unusual form of outdoor advertising. The figure shows the proportions and relative sizes of the standard outdoor ad formats. Note: Spectaculars don’t have standard sizes, so they don’t appear in this figure. You can also explore the growing number of variations on these standards. For example, do you want your message displayed on the floor of a building lobby, on a kiosk at a mall, or alongside the notice boards at health-and-fitness centers? Or how about on signs surrounding the arenas and courts of athletic events? You can use all these options and more by directly contacting the businesses that control such spaces or by using one of a host of ad agencies and media-buying firms that can give you larger-scale access.